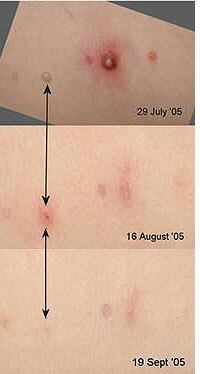 Molluscum contagiosum is caused by a virus that is highly contagious. It causes small, itchy raised spots on the skin, predominantly in infants and young children who infect each other by direct contact. Although not in any way dangerous, it can be quite unsightful and distressing to both child and parents. Sometimes the child is banned from public bathing areas because of it. Traditionally, there has been little in the way of effective treatments available, and, being a general practitioner, for many years I told parents there was nothing that could help eliminate the unsightly spots. Eventually they would disappear, but it could take a year or two. How wrong I was. One of my own children contracted the virus and more as an afterthought, not expecting it to work, applied the wheatgrass cream daily to the lesions. To my surprise, in about three weeks, they had completely disappeared. Now, the collective experience of my and other therapists' patients plus hundreds of people around the world who have reported successful eradication of molluscum with wheatgrass shows that it can take anywhere between two weeks and three to four months for the spots to disappear. We know that because of its very high safety of use in infants and children and treatment failures are rare, it pays to persevere with wheatgrass. Because it contains a higher concentration of wheatgrass extract than the wheatgrass cream, one would expect the spray to be more effective. It is certainly more economical. However, responses vary, so try twice daily application of either formulation and try and be patient. So far I have had no treatment failures using wheatgrass for molluscum.